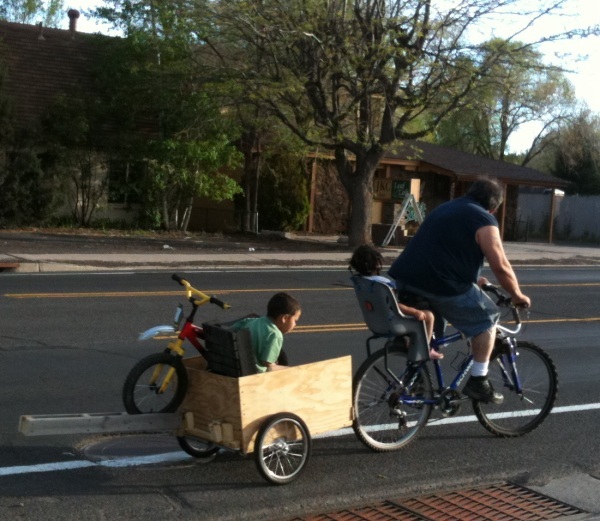 Riding home the other day, I passed this Dad transporting his kids. While at first glance, I couldn’t help to question some of the safety aspects of the rig, these thought were tempered by the evidence that the heavy load would likely keep Dad from riding very quickly except on the downhills.The bike trailer looked like it was utilitizing a regular style bike trailer hitch. I noted on the bike trailer several interesting examples of DIY bike trailer ingenuity. The features that caught my attention the most were the bolted in seat and the bike tranporting boom, which appears to have wheel bays for various size bikes.With his daughter in the bike child seat, his son in the DIY bike child trailer along with bike, this dad is well equipped for car-free family transportation.